As community leaders, it is important to engage your public in how they can participate and make a difference in protecting water resources and reducing costs. Consumers are often willing to do their part and participate in sound water management practices if given accurate and helpful information. The following section provides guidance on how you can best develop an effective water ethic in your community based on transparency and demonstrated stewardship. Living in a water-rich region like ours, it is easy to question water conservation. Beyond reducing unnecessary water waste to avoid supply constraints, other benefits include extending the life of existing infrastructure, slowing down or avoiding the need for expensive, additional water sources, saving on energy and chemical costs for pumping and treating drinking water and providing the opportunity for economic development by having enough supply for additional industry and population growth. The adoption of water-efficient practices such as conservation is seen as an important step to reducing peak demand for drinking water, getting more service out of existing systems and delaying the construction of new, expensive sources. The Village of Algonquin, Illinois implemented a Water Conservation Plan in 2003 to address concerns about the quality and pressure of its water sources, which are shallow aquifers and one deep well. Under the constant threat of shortages, the Village established a Water Conservation Committee to annually implement and revise the goals of the local Water Conservation Plan—a document which includes both water conservation and increased resident awareness goals. While Algonquin has taken several measures to meet its goals, one of the most successful is water system status alerts—which address restrictions on landscape irrigation. 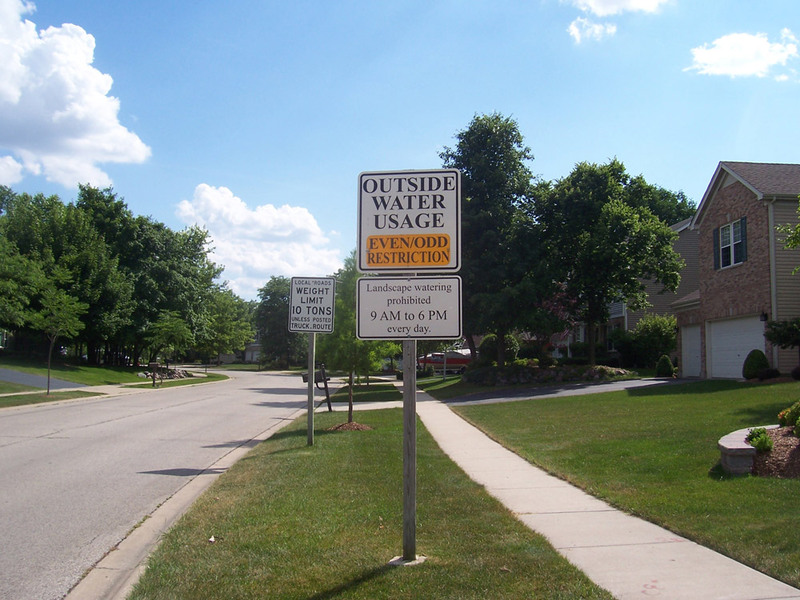 Color-coded alerts are placed around the village to inform residents and businesses of outside water restrictions. If residents or businesses are found to have violated these restrictions, they are fined $100. From 2003–2009, the Village has added 800 households and 300,000 sq. ft. of commercial space. Despite this growth, Algonquin’s summer pumping volumes have decreased from 6 million gallons per day to 3 or 4 million gallons per day. Further progress has also been made in continuing to reduce pumping volumes: From 2007–2016 the average pumping rate has decreased approximately 500,000 gallons per day. And the summer average pumping rates have decreased approximately 700,000 gallons per day. During this time, the Village added approximately 300 residential units and approximately 250,000 square feet of commercial space. Algonquin has proved that communities can grow and thrive without putting unnecessary demand on precious drinking water supplies. These measures can be short- or long-term depending on the needs of the community. Strategic planning is a key aspect of a successful conservation program. This means analyzing how much water is used, when, by whom, for what purpose and at what level of efficiency. Based on this detailed data, a community can determine what the potential reduction in water use could be through conservation approaches to achieve improved water use efficiency. Long-term solutions for conserving, protecting and managing our water resources will require that everyone understands the importance of drinking water, and are provided the programs and tools to help. Citizen education campaigns help highlight the importance of water issues and empower individuals to take action. Media, educational materials, schools and incentive programs help to ensure your community is appropriately informed. for our grandchildren and saving precious dollars for current taxpayers can both be accomplished through a strong water conservation ordinance. Peak demand management is especially important during the summer months when outdoor irrigation use of drinking water spikes and puts extreme pressure on water systems. In our region, the Northwest Water Planning Alliance (NWPA) developed an Outdoor Water Conservation Manual and Model Lawn Watering Ordinance, which has been used by a number of municipalities, and which can easily be adapted for your community to help reduce outdoor watering that puts pressure on drinking water operations. Educational materials, bill inserts, informational pamphlets and brochures can be made available for customers by mail and at their local stores, libraries, schools, etc. This information can help consumers make informed choices about water use, and helps build trust in their community’s local water utility operations. such as showerheads, toilets and bathroom faucets all conserve water, provide savings on water bills and use at least 20 percent less water than conventional products. In 2008, WaterSense products saved consumers 9.3 billion gallons of water and $55 billion on utility bills. Nationwide, dozens of cities, counties and utilities use rebates to spur residents and businesses to purchase these water-efficient products. The WaterSense program also provides free brochures for distribution to customers about landscaping tips and other water conservation practices and facts. It’s free to be a community partner and be a part of a brand that symbolizes water efficiency. There are a number of guides and handbooks that outline best practices for engaging your community in water efficiency practices. References and links to these helpful resources can be found in the resource section of this guide. What conservation practices have we enacted to reduce unnecessary water consumption? Do we have an outdoor watering restriction ordinance? conservation practices for our customers? What community education materials do we have available for residents and businesses? Where? What programs have we implemented to help reduce peak demand on drinking water with our customers?